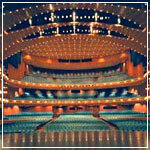 "Harmony 2002", the long awaited performance of Manick Sorcar and his troupe of 14 members, started at 7 pm at the prestigious Procter and Gamble Hall of the Aronoff Center for Performing Arts, Cincinnati, Ohio. Sorcar, the director of Harmony 2002, was interviewed by CBS for a live broadcast on television to promote his new stage production as a fundraiser for AID. Several leading Ohio newspapers gave excellent news coverage of the unique event which integrated live actors with multi-media lighting and laser technology. 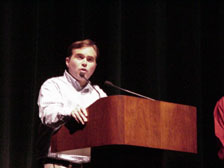 The event was graced by the presence of Councilman John Cranley, City and County of Cincinnati. 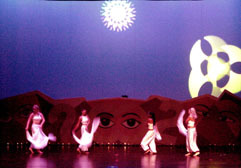 The Opening Ceremony was based on a prayer music piece, which fused of the beats of the East and West. 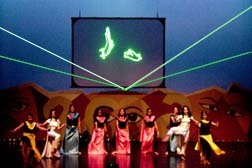 The unique number was enhanced with Sorcar’s spectacular animation and beam effects by the cutting edge technology of laser. The two hour show reflected its "harmony" theme keeping in mind the disturbing incidents that took place during the past year, including September 11 attack, communal riots in India and Israel-Palestinian clashes, to name a few. In its "Harmony" item, a group of dancers united to explore the idea of peace on earth, where the Sun gave special shine for the hope of a new day. The Mayor of Cincinnati, Mr. Charlie Luken, proudly announced to the audience "..A two-hour tantalizing show that uplifts the spirit and helps to bring people together in Greater Cincinnati". It might be interesting to know that Manick Sorcar is one of the handful of US animators who uses laser for moving animation. 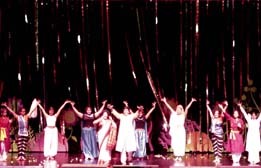 Through "SorcarScope", he combined the life-size laser animation to act with live actors on stage - a feature that is absolutely unique of Manick Sorcar. An electrical engineer specializing in lighting , Manick Sorcar weaved his training in science with his skill in artistry to produce the two hour show which awed the audience. "Like da Vinci", wrote The News Record of Cincinnati, Ohio, "Sorcar is nothing short of a renaissance man. By combining laser beams, animation, computer graphics, magic and traditional Indian dance, Sorcar manages to create an awe-inspiring Indian fantasy world". 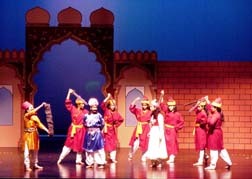 The other items included "Anarkali", where the audience was taken to the Mughal era of India, and "Underwater Fantasy", where they were lifted from their seats to the bottom of blue ocean to witness the rescue of a fairy queen. Sorcar had a special item for the children in the audience where he screened "The Sage & The Mouse", an international award winning animation. This production was directed, produced and animated by Sorcar.